Being a “Certified Appliance Repair Technician” sounds impressive and can open doors with employers and customers. There is no universally recognized certification for Appliance Repair techs, and there are several different organizations offering them. We have found that most customers don't question where your certification comes from. In fact, we've never been asked. Employers are generally the only people interested in what kind of certification a tech has. When an employer looks into where your certification came from, will it pass scrutiny? How should you evaluate the merit of a particular certification that you are considering obtaining? The first step is to take a close look at the entity that is issuing the certification. The quality of the certification can only be as good as the organization behind it. 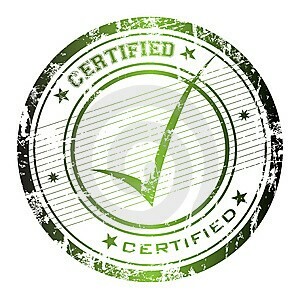 The second step is to evaluate what type of certification it is. Did a tech just pass a one-time test, or does his certification attest that he follow a prescribed course of study, passing numerous tests along the way to show mastery of the material? the Master Samurai Tech blog. Most appliance repair business owners will be familiar with Scott’s work. If they aren’t, a few minutes of looking at the above links will assure them of his expertise and ability to communicate with techs. Certification from the Master Samurai Tech Academy means that the student completed every lesson in a particular course, averaging at least 80% on the quizzes, and then passed the module, midterm, and final exams (where applicable) with at least a 90% score. The final exam is a rigorous test with a number of “open answer” questions that are graded by the MSTA staff. If a student does not pass the first time, he is told which areas he needs to review, and then must take the entire exam again. He does not receive the certification until he has passed! In fact, MST certification is much more like an educational degree and not just simply a certification obtained by passing an exam. The courses at the Master Samurai Tech Academy are rigorous and relevant to today’s modern, computer-controlled appliances. If you are an employer and want to evaluate the MST certification of a job applicant, please see individual course pages for an overview of the topics the applicant would have studied. 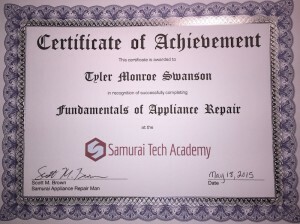 Please contact us if you have any further questions about the Samurai Tech Academy Certification! If you’d like to get more of a look and feel for how the courses work and receive a discount coupon, please try out our FREE Sample Course! I just finished studying module 3 of the Fundamentals and have not taken the test yet, but the knowledge and skill that i have accumulate has enabled me to get hired by A & E factory service here in Durham N.C.
We love hearing success stories from our students so thanks for posting this.